In addition to the product information, service explanations, sales aids, and training materials included in the Start Living Kit, this exclusive enrollment option also contains nine of our top-selling essential oils and essential oil blends. The specially-selected oils in this collection offer ongoing benefits for your health, home, and body. Enjoy the relaxing benefits of lavender and Peace & Calming, the cleansing power of Thieves and Purification, the comforting touch of Valor and PanAway, and more! 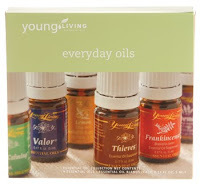 The Everyday Oils enrollment kit provides everything you need to professionally and confidently share Young Living's therapeutic-grade essential oils with others, all at a $10.00 savings over individual product pricing. No need to sell to others, yet you receive a great discount, and the opportunity to earn free merchandise, just by ordering your own oils! The Autoship option also saves you money on shipping, by offering a flat rate on your automatic monthly order.